Inspiration is a wonderful experience and we hold close to heart the things from which we receive inspiration from. 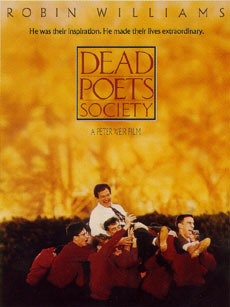 I have watched for the first time ‘Dead Poets Society’ and I have truly been touched. It was produced in 1989 and is almost as old as me but the lessons taught in this movie can most definitely be applied today. My personal belief is that one’s body, mind, spirituality and emotions needs to be ready to receive inspiration, and inspiration can be drawn from anything as long as you are ready to accept it. Had I watched Dead Poets Society years ago I probably wouldn’t have appreciated it as I have done now – why because my mind and spirituality is ready to accept inspiration but may not have been years ago. Some have trouble understanding how to define the word ‘inspiration’, for me its simple – it’s a combination of vision, determination, courage and to be different. This is what inspiration means to me. What really makes this movie special is how the teacher (who is part of an established system but has challenged it before) encourages its students to think differently from what was known to be normal, to be free from the system they enrolled to and to rise to a new level beyond the level that was expected, to explore their fears to become fearless. This is not a review of the movie by any means – but I would like to touch upon few words that were said in the movie – words which sends shivers down your spine – especially if you’re prepared to understand the real meaning behind them. Notice how the students (casual people) are amazed when something different or out of the ordinary happens (the teacher walks out whistling) – how the confusion of the masses occurs. The confusion continues when they are asked to follow (come out to the hall way by the teacher) or do something that is not normal to the system. In the end the students still seem to be confused but unsure. This for me is how our society is today confused in masses. I have watched this movie twice in as many weeks and hope to watch it again some point this week – it is that good, I just don’t feel that I have been able to absorb all of what is given from this movie. This moment in the movie (for me) is when the students have been prepared to start thinking different, to do what the society least expects or scared to do. It’s about making a difference and that difference is what changes the world. This post on the Dead Poets society is by no means concluded, as I will no doubt want to add to this later, as I continue to watch the movie again and again. My advice to you is ‘it’s a must’ and I’ll go as far as saying buy it and add to your DVD collection – you never know when you might need to draw more inspiration, vision, determination and courage out of it. It’s basically a master piece.